Fever, also known as pyrexia or a febrile response, is a temporary elevation in the core body temperature of warm-blooded animals to levels that are above the normal range as a result of abnormal functioning of the thermoregulatory mechanisms. For example, the common oral measurement of normal human body temperature is 36.8±0.7°C or 98.6±1.3°F. An oral temperature at or above 37.5°C (99.5°F) is commonly considered a fever if resulting from such causes as a viral or bacterial infection, an allergic reaction, drugs, damage to the hypothalamus, and so forth. Fever is a frequent medical symptom. Technically, fever is most accurately characterized as a temporary elevation in the body’s thermoregulatory set-point, usually by about 1-2°C. That is, the body's "thermostat" resets at a higher than normal temperature. Fever differs from hyperthermia, which is an increase in body temperature over the body’s thermoregulatory set-point (due to excessive heat production or insufficient thermoregulation, or both). Carl Wunderlich discovered that fever is not a disease, but a symptom of disease. Fever can be uncomfortable for the patient and be accompanied by fatigue, nausea, chills, sweating, and so forth. At times, particularly when occurring in the very young or elderly, it can be life threatening. However, fever generally is a useful response of the body. It helps to reveal an underlying condition that may need treatment, and the fever itself may be helpful in terms of speeding up various immunological reactions. Some physicians believe that since a fever helps the immune system fight infection, it usually should be allowed to run its course, although various treatments, including anti-pyretic drugs, may be taken if the patient is uncomfortable or the condition is dangerous (Longe 2006). However, in general, the key treatment for a fever is to address the underlying causes. Fever is a rather remarkable response of the body. It is not a passive response to the body being overwhelmed, but rather involves complex and coordinated enzymatic and hormonal interactions to set the thermostat at a higher level. This results in a multitude of responses of the body to a condition, such as changes in metabolic rate and blood flow, shivering, and sweating. When the underlying condition is resolved, homeostasis at the normal level returns. Hypothermia: Characterized in the center: Normal body temperature (thermoregulatory set-point) is shown in green, while the hypothermic temperature is shown in blue. As can be seen, hypothermia can be conceptualized as a decrease below the thermoregulatory set-point. Fever: Characterized on the right: Normal body temperature (thermoregulatory set-point) is shown in green. It reads “New Normal” because the thermoregulatory set-point has risen. This has caused what was the normal body temperature (in blue) to be considered hypothermic. The body temperature of a human fluctuates around an average of about 98.6°F, or about 37°C. It may be 97°F in the morning and as high as 99.3°F in the afternoon, but is still considered to be normal (Longe 2005a). The body maintains homeostasis within this range by regulating the heat produced by metabolism with the heat lost from the body, a process that is controlled by a "thermostat" located in the hypothalamus within the brain (Longe 2006). If the nervous system relays information that the temperature of the body is high, then the body may do such actions as increasing the flow of blood from the body's core to the surface, slowing down the metabolic rate, and inducing sweating to dissipate the heat through evaporation (Longe 2006). If the temperature is low, then the body may react by shivering to produce heat, speeding up the metabolic rate, or decreasing the flow of blood from the body's core. A fever occurs when the thermostat resets at a higher temperature (Longe 2006). The elevation in thermoregulatory set-point means that the previous "normal body temperature" is considered hypothermic, and effector mechanisms kick in. The person who is developing the fever has a cold sensation, and an increase in heart rate, muscle tone, and shivering attempt to counteract the perceived hypothermia, thereby reaching the new thermoregulatory set-point. The chills one experiences when one first has a fever results from the flow of blood from the extremities to the body's core, leaving the extremities cold; the shivering and chills stop when the higher temperature is reached (Longe 2006). A fever is commonly caused by a bacterial or viral infection, such as the influenza, but may also be caused by damage to the hypothalamus, drugs, such cancers as leukemia and lymphoma, an [[allergy}allergic reaction]], and so forth. When the infection has been defeated by the immune system or anti-pyretic drugs such as aspirin or acteaminophen are taken, the thermostat resets to normal and the body's cooling mechanisms, such as sweating, switch on (Longe 2006). However, there are many variations in normal body temperature, and this needs to be considered when measuring fever. Body temperature normally fluctuates over the day, with the lowest levels at 4 a.m. and the highest at 6 p.m. Therefore, an oral temperature of 37.5°C would strictly be a fever in the morning, but not in the afternoon. Normal body temperature may differ as much as 0.4°C (0.7°F) between individuals. 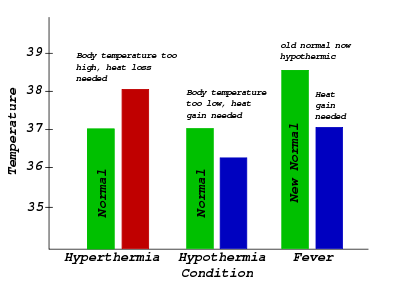 In women, temperature differs at various points in the menstrual cycle, and this can be used for family planning (although it is only one of the variables of temperature). Temperature is increased after meals, and psychological factors (like a first day in the hospital) also influence body temperature. Temperature is ideally always measured the same moment of the day, in the same way, after the same amount of activity. Temperature is regulated in the hypothalamus, in response to the hormone PGE2. PGE2 release, in turn, comes from a trigger, a pyrogen. The hypothalamus generates a response back to the rest of the body, making it increase the temperature set-point. The set-point temperature of the body remains high until PGE2 is no longer present. Substances that induce fever are called pyrogens. These are both internal or endogenous, and external or exogenous, such as the bacterial substance LPS. Exogenous pyrogens, such as produced by bacteria, viruses, yeasts, or parasites, may act upon white blood cells to produce further, endogenous pyrogens (Blakemore and Jennett 2001). Endogenous pryogens also may be released from tumors, from blood clots, from an autoimmune diseases, or from the brain after an injury or stroke (Blakemore and Jennett 2001). The endogenous pyrogens interact with prostaglandin synthetase, the enzyme that is involved in synthesis of prostagladines, which are the main agents for the resetting of the thermostat (Blakemore and Jennett 2001). Aspirin can abolish fever because it inhibits the action of prostaglandin synthetase (and thus does not effect temperature when used in the absence of fever) (Blakemore and Jennett 2001). Endogenous pyrogens. The endogenous pyrogens (such as interleukin 1) are a part of the innate immune system, produced by phagocytic cells, and cause the increase in the thermoregulatory set-point in the hypothalamus. Other examples of endogenous pyrogens are interleukin 6 (IL-6), and the tumor necrosis factor-alpha. These cytokine factors are released into general circulation, where they migrate to the circumventricular organs of the brain, where the blood-brain barrier is reduced. The cytokine factors bind with endothelial receptors on vessel walls, or interact with local microglial cells. When these cytokine factors bind, they activate the arachidonic acid pathway. Exogenous pyrogens. One model for the mechanism of fever caused by exogenous pyrogens includes lipopolysaccharide (LPS), which is a cell wall component of gram-negative bacteria. An immunological protein called Lipopolysaccharide-Binding Protein (LBP) binds to LPS. The LBP-LPS complex then binds to the CD14 receptor of a nearby macrophage. This binding results in the synthesis and release of various endogenous cytokine factors, such as interleukin 1 (IL-1), interleukin 6 (IL-6), and the tumor necrosis factor-alpha. In other words, exogenous factors cause release of endogenous factors, which, in turn, activate the arachidonic acid pathway. PGE2 is the ultimate mediator of the febrile response. The set-point temperature of the body will remain elevated until PGE2 is no longer present. PGE2 acts near the ventromedial preoptic area (VMPO) of the anterior hypothalamus and the parvocellular portion of the periventricular nucleus (PVN), where the thermal properties of fever emerge. It is presumed that the elevation in thermoregulatory set-point is mediated by the VMPO, whereas the neuroendocrine effects of fever are mediated by the PVN, pituitary gland, and various endocrine organs. increased heat production by increased muscle tone, shivering, and hormones like epinephrine. The autonomic nervous system may also activate brown adipose tissue to produce heat (non-exercise associated thermogenesis, also known as non-shivering thermogenesis), but this seems mostly important for babies. Increased heart rate and vasoconstriction contribute to increased blood pressure in fever. The last is clearly a medical emergency because it approaches the upper limit compatible with human life. Pel-Ebstein fever is a specific kind of fever associated with Hodgkin's lymphoma, being high for one week and low for the next week and so on. However, there is some debate whether this pattern truly exists. Continuous fever: Temperature remains above normal throughout the day and does not fluctuate more than 1 degree C in 24 hours. Eg: lobar pneumonia, typhoid, urinary tract infection, brucellosis, typhus, etc. Typhoid fever may show a specific fever pattern, with a slow stepwise increase and a high plateau. Intermittent fever: Temperature is present only for some hours of the day and becomes normal for remaining hours.Eg: malaria, kala-azar, pyaemia, septicemia etc. In malaria, there may be a fever with a periodicity of 24 hours (quotidian), 48 hours (tertian fever), or 72 hours (quartan fever, indicating Plasmodium vivax). These patterns may be less clear in travelers. Remittent fever: Temperature remains above normal throughout the day and fluctuates more than 1 degree C in 24 hours. Eg: infective endocarditis, etc. Infectious disease, e.g. influenza, common cold, HIV, malaria, infectious mononucleosis, gastroenteritis, and so forth. Various skin inflammations such as boils, pimples, acne, abscess, and so forth. Immunological diseases like lupus erythematosus, sarcoidosis, inflammatory bowel diseases, and so forth. Tissue destruction, which can occur in hemolysis, surgery, infarction, crush syndrome, rhabdomyolysis, cerebral hemorrhage, and so forth. Metabolic disorders like gout, porphyria, and so forth. Persistent fever, which cannot be explained after repeated routine clinical inquiries, is described obviously, as a fever of unknown origin. There are arguments for and against the usefulness of fever, and the issue is controversial (Schaffner 2006; Soszynski 2003). There are studies using warm-blooded vertebrates (Su et al. 2005) and humans (Schulman et al. 2005), with some suggesting that they recover more rapidly from infections or critical illness due to fever. Theoretically, fever has been conserved during evolution because of its advantage for host defense (Schaffner 2006). There are certainly some important immunological reactions that are sped up by temperature, and some pathogens with strict temperature preferences could be hindered (Fischler and Reinhart 1997). The overall conclusion seems to be that both aggressive treatment of fever (Schulman et al. 2005) and too little fever control (Schaffner 2006) can be detrimental. This depends on the clinical situation, so careful assessment is needed. Fever should not necessarily be treated. Fever is an important signal that there is something wrong in the body, and it can be used for follow-up. Moreover, not all fevers are of infectious origin. In some cases, emergency treatment is called for in the case of fever. These cases include a newborn child (three months or younger) with a temperature over 38°C (100.5°F), an infant or child with a temperature over 39.4°C (103°F), or a fever accompanied with mental confusion, severe swelling of the throat, severe headache, or neck stiffness (Longe 2005b). A very high fever in a small child may trigger seizures, and a fever accompanied by the above symptoms may signal the presence of a serious illness, such as meningitis (Longe 2006). Addressing of the underlying causes is the most effective treatment of a fever, such as the use of antibiotics to deal with bacterial infections (Longe 2006). Most people take medication against fever because the symptoms cause discomfort. Fever increases heart rate and metabolism, thus potentially putting an additional strain on elderly patients, patients with heart disease, and so forth. This may even cause delirium. Therefore, potential benefits must be weighed against risks in these patients. In any case, fever must be brought under control in instances when fever escalates to hyperpyrexia and tissue damage is imminent. Treatment of fever should be based primarily on lowering the setpoint, but facilitating heat loss may also contribute. The former is accomplished with antipyretics. Wet cloth or pads are also used for treatment, and applied to the forehead. Heat loss may be an effect of (possibly a combination of) heat conduction, convection, radiation, or evaporation (sweating, perspiration). This may be particularly important in babies, where drugs should be avoided. However, if water that is too cold is used, it induces vasoconstriction and prevents adequate heat loss. Aspirin should not be given to a child or adolescent (nineteen years of age or younger) with a fever because this drug has been linked to Reye's syndrome, which can cause brain or liver damage, and even death (Longe 2006). There also are alternative treatments that are sometimes followed, such as biofeedback, holistic healing, herbal medication, and relaxation therapy (Longe 2005b). Fischler, M. P., and W. H. Reinhart. 1997. Fever: Friend or enemy? Schweiz Med Wochenschr 127: 864-70. Kasper, D. L., E. Braunwald, A. S. Fauci, s. L. Hauser, D. L. Longo, and J. L. Jameson. 2005. Harrison's Principles of Internal Medicine. New York: McGraw-Hill. ISBN 0071391401. Longe, J. L. 2005a. The Gale Encyclopedia of Cancer: A Guide to Cancer and its Treatments. Detroit: Thomson Gale. ISBN 1414403623. Longe, J. L. 2005b. The Gale Encyclopedia of Alternative Medicine. Detroit: Thomson Gale. ISBN 0787674249. Rhoades, R., and R. G. Pflanzer. 1996. Human Physiology. Fort Worth: Saunders College Pub. ISBN 0030051592. Schaffner, A. 2006. Fever: Useful or noxious symptom that should be treated? Ther Umsch 63: 185-8. Schulman, C. I., N. Namias, J. Doherty, et al. 2005. The effect of antipyretic therapy upon outcomes in critically ill patients: A randomized, prospective study. Surg Infect (Larchmt) 6: 369-75. Soszynski, D. 2003. The pathogenesis and the adaptive value of fever. Postepy Hig Med Dosw 57: 531-54. Su, F., N. D. Nguyen, Z. Wang, Y. Cai, P. Rogiers, and J. L. Vincent. 2005. Fever control in septic shock: Beneficial or harmful? Shock 23: 516-20. This page was last modified on 20 October 2013, at 18:27.